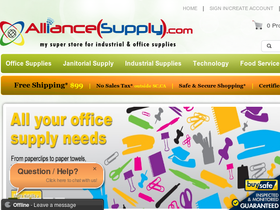 Alliance Supply, online at alliancesupply.com, is the superstore for industrial and office supplies. Alliance Supply carries tools, stationary, office chairs, audio/visual equipment, cables, electrical tools, calendars, breakroom products, janitorial supplies, desk organizers, electrical and lighting supplies, and much more. Alliance Supply offers brand names like Lexmark, Oxford, Pendaflex, Papermate, Rubbermaid, Safco, ShopVac, Stanley, Solo, Sylvania, Verbatim, Xerox, and others. Alliance Supply also offers discounts and low prices. So before you shop, get all the best alliancesupply.com discounts, Alliance Supply promotions, and Alliance Supply coupon codes found here at RetailSteal.com. Alliance Supply offers next day shipping within the 48 contiguous United States. Alliance Supply also offers international shipping. See site for more information. Save up to 60% or more on the featured products at Alliance Supply. Click to shop. Get free shipping from Alliance Supply on purchases $99+. Click link to shop. Save 28% on the Shop-Vac 18 GAL. 6.5 PEAK HP WET/DRY VACUUM from Alliance Supply. Click to shop. Shop for food and beverage supplies from just $0.66 from Alliance Supply. Click to shop. Shop for packaging supplies from just $6.44 from Alliance Supply. Shop now. Shop for office task chairs, starting from $70 from Alliance Supply. Click link to shop. Shop for low cost janitorial supplies from Alliance Supply. Plus, enjoy fast delivery. Click link to shop. Alliance Supply offers fast next day shipping to most of the continental United States. Click to shop.